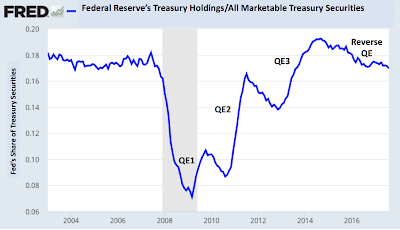 Now that the shrinking of the Fed's balance sheet has been announced, I thought it worth nothing what it means for the future path of the monetary base. Drawing upon the Fed's median forecast of its assets through 2025 that comes from the 2016 SOMA Annual Report, I was able to create the figures below. The figures show the trend growth path of currency and a series I call the 'permanent monetary base' extrapolated to 2025. The latter series is the monetary base minus excess reserves. This measure has been used by Tatom (2014) and Belongia and Ireland (2017) as a more reliable indicator of the monetary base that actually matters for monetary conditions. These two measures, which reflect the liability side of the Fed's balance sheet, are plotted along side the projected path of the asset side of the Fed's balance sheet. The first figure below shows this exercise in terms of dollars and the latter one is in log-levels. What is interesting is that the Fed's median forecast of its assets eventually converges with the trend growth of currency which historically has made up most of the monetary base. Unsurprisingly, the permanent measure of the monetary base also tracks currency's trend path. Jim Hamilton does something similar here. So what are the takeaways? First, the Fed is expecting to confirm the temporary nature of the monetary expansion under the QE programs. That is, the only major growth in the monetary base the Fed expects to persist is that coming from the normal currency demand growth that follows the growth of the economy. This endogenous money growth would have happened in the absence of QE. Second, the temporary nature of the QE programs, implied by these figures, is a key reason why these programs did not spur a robust recovery. For reasons laid out in this blog post and in this forthcoming article, there needed to be some exogenous permanent increase in the monetary base to spur robust aggregate demand growth. It never happened and neither did the much-needed recovery. Instead we got the monetary regime change we never asked for. Update I: See George Selgin's take on why QE was not very effective. Update II: Brian Bonis, Jane Ihrig, and Min Wei from the Board of Governors just posted a note with the latest forecast of the Fed's balance sheet. It is updated to include the latest information from the recent FOMC meetings. My figures come from an earlier forecast and are a bit dated relative to these numbers. Their forecasted end value for the SOMA holdings ranges from $2.6 to $3.2 trillion. The median forecast I used above ends up at $3.2 trillion. So my trends would fit their high end estimates. Most folks know the arguments for and against shrinking the Fed's balance sheet on purely economic terms. For a good recap of these arguments see Cardiff Garcia, Henry Curr, and Nick Timiraos. There are however, other political economy forces at work that potentially play into the Fed's decision to shrink its balance sheet. Most folks do not go there because it is a controversial approach. For it takes a more cynical view of government officials. It goes beyond the view of the Fed as a technocratic institution filled with saintly people doing their best to stabilize the business cycles. It recognizes that people are people no matter where they work and are responsive to political incentives. Now to be clear, many good people work at the Fed because they believe in the mission. But to say the mission is the only thing they consider would be naive. Fed officials, like most people, also care about their own well-being. On the margin, this influences their decision making at the Fed. This political economy critique of the Fed is not a new one. Mark Toma has entire book on the topic. But most observers, including myself, rarely apply it to the Fed. This includes recent discussions about the Fed's decision to shrink its balance sheet. 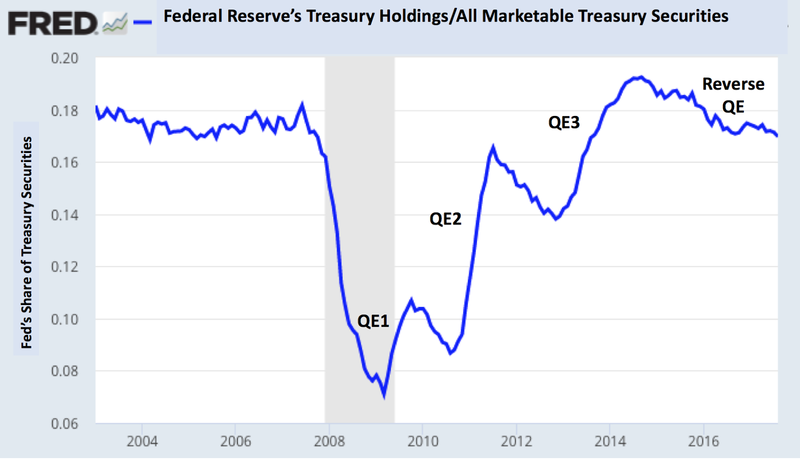 The large-scale asset purchasing program, better known as quantitative easing, caused the Fed’s balance sheet to grow from roughly $900 billion in late 2008 to $4.5 trillion. Over the past few years, it has averaged near $100 billion in profits. Prior to the crisis, its profits averaged only $25 billion per year. 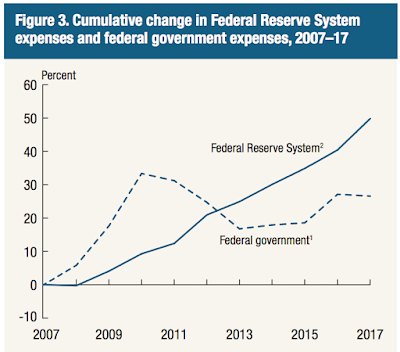 The Fed’s profitability has allowed its budget to grow 4.1 percent per year between 2007 and 2017, compared to 2.4 percent for the federal government. Given the profitability, prestige and jobs created by maintaining the Fed’s large balance sheet, it will not be painless for the Fed to shrink it. 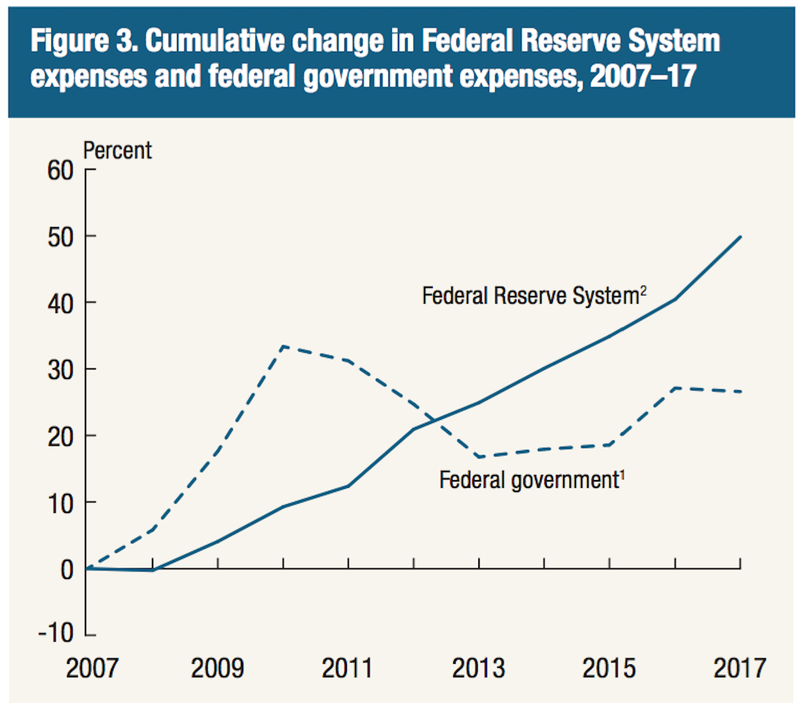 Now some may say this increased spending is due, in part, to the new regulatory responsibilities the Fed has taken on since the crisis. Maybe so, but the Fed has been one of the biggest champions of its new regulatory role. Whether you believe the Fed is a good regulator or not, it has an incentive to expand its budget, prestige, and influence over finance via its regulatory role. Keeping its balance sheet large helps facilitate this expansion. So this is a political economy force for keeping its balance sheet large. [T]he Fed may be eager to unwind its balance sheet [because] it is bad optics politically. The large expansion of the Fed’s asset holding accompanies a similar-sized expansion of its liabilities. Most of the increased liabilities have been in the form of banks’ excess reserves. Banks deposit these at the Fed and earn the IOER payment. 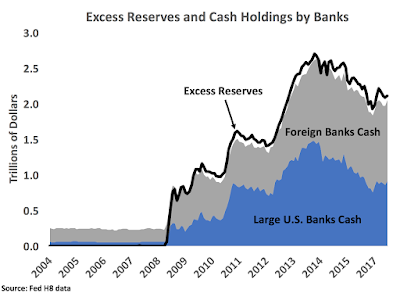 As seen in the figure below, almost all of the excess reserves parked at the Fed are cash holdings of foreign and large domestic banks. That means foreigners and the U.S. banks bailed out during the crisis are getting most of the interest payments from the Fed. If the Fed’s balance sheet was maintained and short-term interest rates eventually rose to 3 percent (as expected), these banks would get approximately $66 billion a year from the Fed. To illustrate this point, we again go back to the Fed's 2016 annual report. It shows the Fed's net expenses jumped from roughly $11 billion in 2015 to $17 billion in 2016. That is a huge percentage increase. Almost of all it came from the large IOER payments the Fed had to pay in 2016 because of higher interest rates. Specifically, the IOER payment went from $6.8 billion in 2015 to $12.1 billion in 2016. This is horrible optics: the Fed's expenses are ballooning because it is paying more to foreign banks and the large U.S. banks we bailed out. The Fed can avoid this controversy by shrinking its balance sheet. As I note in the piece, it is not often that an important government agency voluntarily agrees to actions that will reduce its budget and reach. Yet, the Fed is doing just that by shrinking its balance sheet. 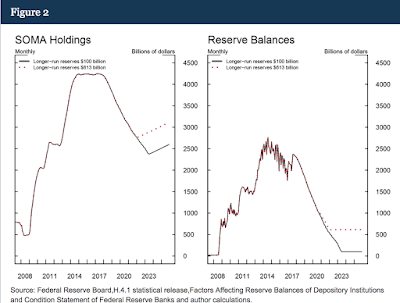 It suggests to me that the IOER issue, in conjunction with the other reasons stated by the Fed for shrinking its balance sheet, may be more important than many observers now realize. P.S. 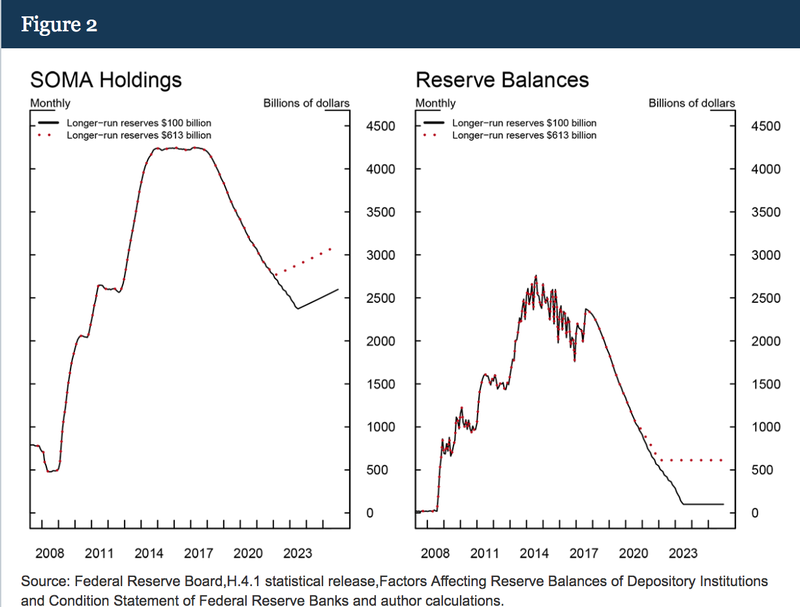 The above assumes the Fed actually goes through with shrinking its balance sheet. I mention in a previous post that the IOER-treasury bill spread if left uncheck may prevent that from happening. This week the Fed is expected to announce it will begin shrinking its balance sheet. Will it matter? To answer that question it is useful to first recall how and why the Fed's balance sheet was expanded. Between December 2008 and October 2014 the Fed conducted a series of large scale asset purchases (LSAPs) that expanded its balance sheet from about $900 billion to $4.5 trillion. That is an expansion of about 500 percent. The Fed turned to LSAPs for additional stimulus when its target for the federal funds rate—the traditional tool of U.S. monetary policy—hit the zero lower bound in late 2008. The main theory the Fed used to justify the LSAPs was the portfolio balance channel. It says that because of market segmentation the Fed's purchase of safe assets would force investors to rebalance their portfolios toward riskier assets. This rebalancing, in turn, would reduce risk premiums, lower long-term interest rates, and push up asset prices. This would help the recovery. This figure also shows another development that has taken place since late 2014: the Fed's share of treasuries has been shrinking. I call this the Fed's "reverse QE" program. Per the portfolio channel, this should be a passive tightening of monetary policy as the Fed's share of safe assets has fallen. Put differently, this should be portfolio rebalancing in reverse that causes long-term treasury yields to rise. This implies the Fed's shrinking of its balance sheet should not be a big deal. The Fed has been signaling for some time it would start shrinking its balance sheet this year. It even released a detailed plan in June of how it will happen. So there should be no surprises--the Fed is carefully using the signaling channel to keep markets calm. Given this signaling and the lack of a binding portfolio balance channel, the concerns about the shrinking of the Fed balance sheet causing monetary policy to tighten are mostly noise. The second reason the scaling back of the Fed's balance sheet may be challenging is that post-2008 regulation now requires banks to hold more liquid assets. Specifically, banks now have to hold enough high-quality liquid assets to withstand 30 days of cash outflow. This liquidity coverage ratio has increased demand for such assets of which bank reserves and treasury securities are considered the safest. 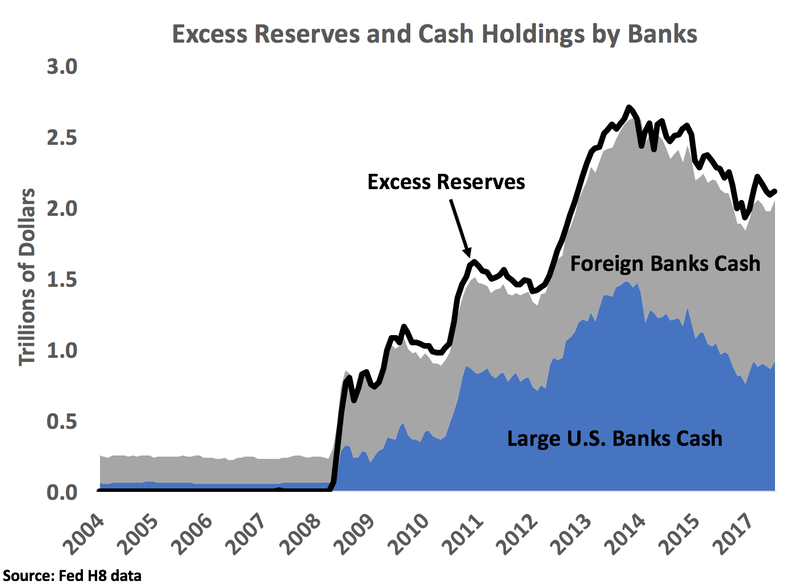 So, in theory, as the Fed shrank its balance sheet, the banks could simply swap their excess reserves (that the Fed was pulling out of circulation) for treasury bills (that the Fed was putting into circulation). 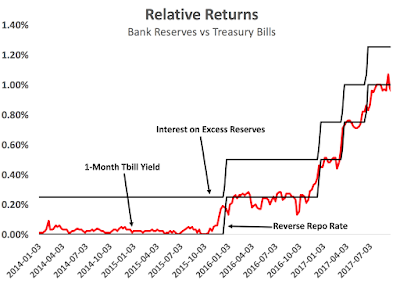 The challenge, as observed by George Selgin, is that the Fed's interest on excess reserves has been higher than the interest rate on treasury bills. This creates relatively higher demand for bank reserves. Banks would not want to give up the higher-earning bank reserves at the very moment the Fed was trying to pull them out of circulation. This tension could create an effective shortage of bank reserves and be disruptive to financial markets. The solution here would be for the Fed to lower the interest on excess reserves to the level of treasury bill interest rates. The figure below illustrates this potential problem. It shows the Fed's upper and lower bounds on the federal funds rate and the 1-month treasury bill interest rate. These upper bound is the IOER and the lower bound is the reverse repo rate. The reverse repo rate has (sort of) anchored the 1-month treasury bill yield, but the issue is the spread between it and the IOER. 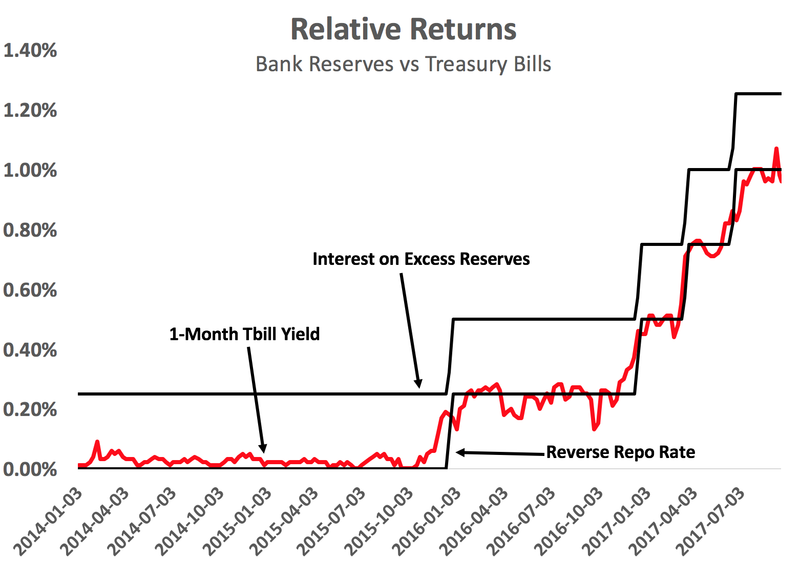 Why would banks want to give up bank reserves for treasury bills when reserves earn at least 25 basis points more than treasury bills? The Fed will be pushing against this demand when it tries to pull the excess reserves out of the banking system. Good luck wth that. To summarize, we need not worry about the portfolio balance channel kicking into reverse as the Fed begins shrinking its balance sheet. 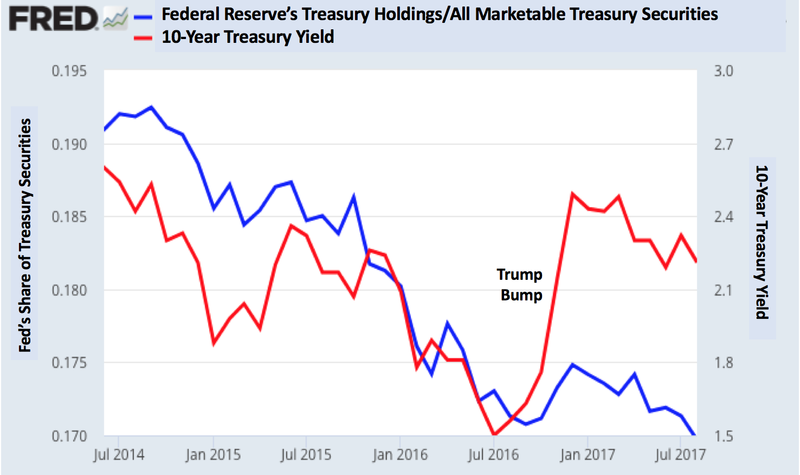 We should, however, worry about the distortions created by the positive IOER-treasury bill yield spread as Fed unwinds its asset holdings. The Fed can fix this problem by equalizing IOER and short-term market interest rates. Update: Cardiff Garcia reviews a research note by Nomura's Lew Alexander on shrinking the Fed's balance sheet. Also, Nick Timiraos has a nice long piece on the Fed's LSAPs in the WSJ. During the financial crisis the above assumptions were probably reasonable when markets froze up and the Fed become the lender of last resort. So QE1 probably made a meaningful difference. But after the crisis it is hard to make a convincing case for the assumptions holding. That is why QE2 and QE3 probably did not pack much punch. See Stephen Williamson, John Cochrane, or Michael Woodford (p. 61-65) for more on the theoretical problems with the Fed's understanding of the portfolio balance channel. 2The signaling channel is based on the idea that the LSAPs indicate a firm commitment by the Fed to keep interest rates low for a long period that would not be evident in the absence of the LSAPs. Christina Romer, former CEA chair, called for a monetary regime change several times between 2011 and 2013. It is now several years later and it appears we did finally get a monetary regime change. Unfortunately, it is not the kind of regime change Christina advocated and actually goes in the opposite direction. Christina called for the Fed to adopt a nominal GDP level target that would restore aggregate demand to its pre-crisis growth path. Instead, we got a regime change that has effectively lowered the growth rate and the growth path of aggregate demand. This regime change, in my view, is behind the apparent drop in trend inflation that Greg Ip recently reported on in the Wall Street Journal. It is not easy to change trend inflation--just ask Paul Volker--but the Fed and other forces seemingly accomplished just that over the past decade. Since the end of the crisis, the average inflation rate on the Fed's preferred measure of inflation, the core PCE deflator, has fallen to 1.5 percent The headline PCE deflator average has fallen to 1.4 percent over the same period. Both are well below the Fed's target of 2 percent. This persistent shortfall of inflation has received a lot of attention from critics, including me. Lately, some Fed officials are also beginning to see the inflation shortfall as more than a series of one-off events. Governor Lael Brainard's recent speech is a good example of this change in thinking with her acknowledgement that trend inflation may be falling. Still, there is something bigger going on here that is being missed in these conversations about the inflation rate. A monetary regime change has occurred that has lowered the growth rate and growth path of nominal demand. Since the recovery started in 2009Q3, NGDP growth has averaged 3.4 percent. This is below the 5.4 percent of 1990-2007 period (blue line in the figure below) or a 5.7 percent for the entire Great Moderation period of 1985-2007. Macroeconomic policy has dialed back the trend growth of nominal spending by 2 percentage points. That is a relatively large decline. This first development can be seen in the figure below. The figure above also speaks to the second part of this regime change: aggregate demand growth was not allowed to bounce back at a higher growth rate during the recovery like it has in past recessions. Historically, Fed policy allowed aggregate demand to run a bit hot after a recession before settling it back down to its trend growth rate. This kept the growth path of NGDP stable. You can see this if the figure above by noting how the growth rate (black line) typically would temporarily go above the trend (red line) after a recession. 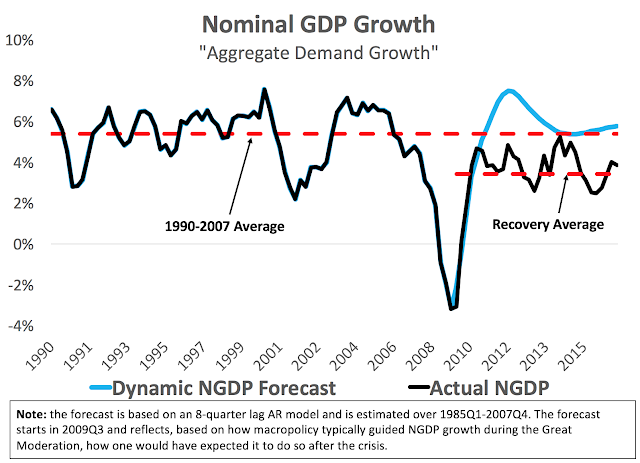 Had macroeconomic policy allowed aggregate demand growth to follow its typical bounce-back pattern after a recession, we would have seen something like the blue line in the figure. This line is a dynamic forecast from a simple autoregressive model based on the Great Moderation period. 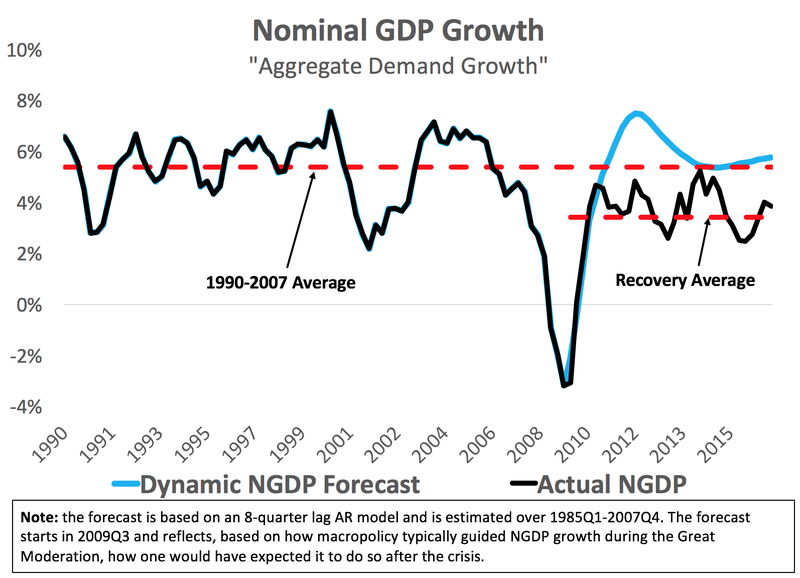 This naive forecast shows one would have expected NGDP growth to have reached as much as 8 percent during the recovery before settling back down to its average. Instead we barely got over 3 percent growth. This is why NGDP has never caught back up to its pre-crisis trend path. Again, these two developments are, in my view, the real story behind the drop in trend inflation. 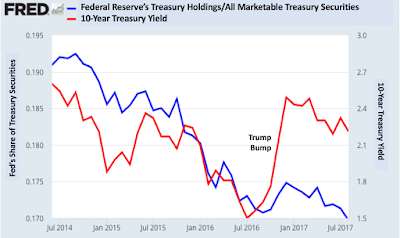 And to be clear, I think both the Fed's unwillingness to allow temporary overshooting and the safe asset shortage problem have contributed to it. So this is a joint monetary-fiscal problem that has effectively created a monetary regime change. So yes, we got a monetary regime change, but no it is not the one Christina Romer and most of us wanted.